Whenever George R.R. 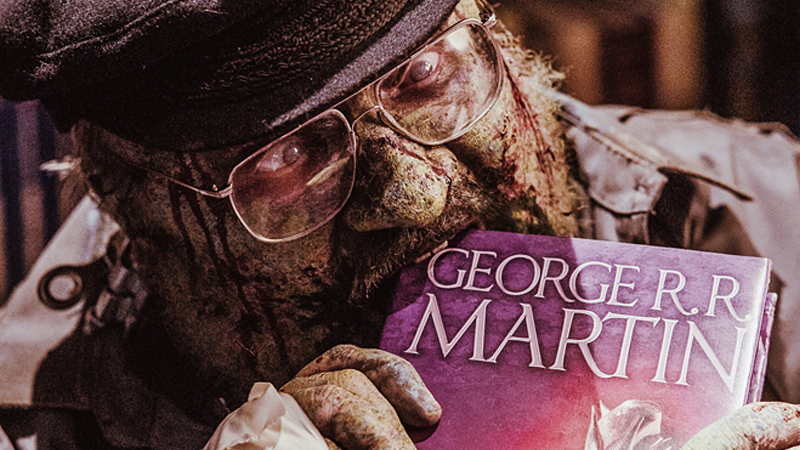 Martin does anything that isn’t releasing the next A Song of Ice and Fire novel, some (typically crass) people tend to cry “he’ll be dead before he finishes!” But apparently Syfy’s Z Nation is going to show that not even a little thing like zombification can stop Martin from writing. Wait, what? Yes, Entertainment Weekly have announced that the writer will make a cameo in the eighth episode of Z Nation’s upcoming second season—and naturally, the author is going to be playing a zombie. And not just any zombie, but the deceased Martin himself... who is naturally still writing, and attending signings of future books in his epic fantasy saga. And not even the hotly anticipated Winds of Winter! Instead, it’s A Promise of Spring, a pastiche of what is expected to be the title of the seventh and final book in the series, A Dream of Spring. So good news, Game of Thrones fans: we’ll definitely be getting the complete A Song of Ice and Fire series. The bad news? You’ll have to survive the post-apocalypse to find out what happens. You know, I really hope Martin keeps doing goofy things like this, only for the delectable rage that occurs when people are upset at him “wasting his time” and not writing more. It’s almost as satisfying as actually getting Winds of Winter will be.